Established in 1971, the Herbert H. Lehman Collections serve the Columbia academic community and scholars from around the world. The Collections include the personal and official papers of Governor Lehman, as well as those of his wife, Edith Altschul Lehman; Frank Altschul; Charles Poletti; Paul Baerwald; Julius Edelstein; James G. McDonald; the Senate Research Papers of William B. Welsh; and the United Nations Relief and Rehabilitation Administration (UNRRA) papers of Hugh R. Jackson, Robert G.A. Jackson, Marshal McDuffie, and Richard B. Scandrett. In addition, the Non-Sectarian Anti-Nazi League Collection of Pamphlets and Periodicals and UNRRA microfilm records from 1943 to 1949 are part of the Collections. Links to finding aids for the Lehman Collections. Scanned documents from the Special Correspondence series of the H.H. Lehman Papers. Political Cartoons from the Papers of Herbert H. Lehman. 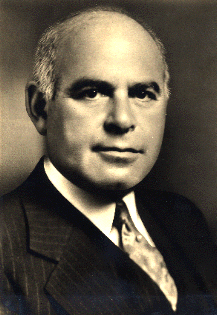 Herbert H. Lehman's life and career. In order to make the Lehman collections easier for patrons to request and access, the collections will be open on a limited basis until further notice. Although access is limited, every effort will be made to accommodate your research needs if at all possible. Please contact Carolyn Kay Smith, Archivist, if you have further questions. Thank you for your patience.